..."for those who are not familiar with the Klin-Zha project I am undertaking, I have enclosed a short report of how [I envision a Clouded Variant of] the game is played. When I first read The Final Reflection by John M. Ford, I was truly inspired by the game. To me it embodied all that is Klingon and gave a warrior the opportunity to devcelop his skill, and, more importantly, the attitude necessary to survive in the Empire. That is why I developed this concept for the Clouded Version of Klin-Zha. At first, all versions of KIin-Zha I had heard of were just variations of Chess--different pieces and board design, but the same basic concept. What I wanted was a game that would develop attitude. I mean, how helpful could a two-dimensional game be in a starship in space? Sure, it would have its merits, but I believe my proposed game would be instrumental in developing that Klin necessary for survival. If the board grid were to change randomly after every move, it would be necessary to move as if each move were your last. This would de-emphasize long, drawn-out strategies. That is to say, the game could be over in an instant, and one's strategy could fall in the blink of an eye. Instead of focussing on where you will be in five or six moves, you'll just have to do the best you can with what the board gives you. 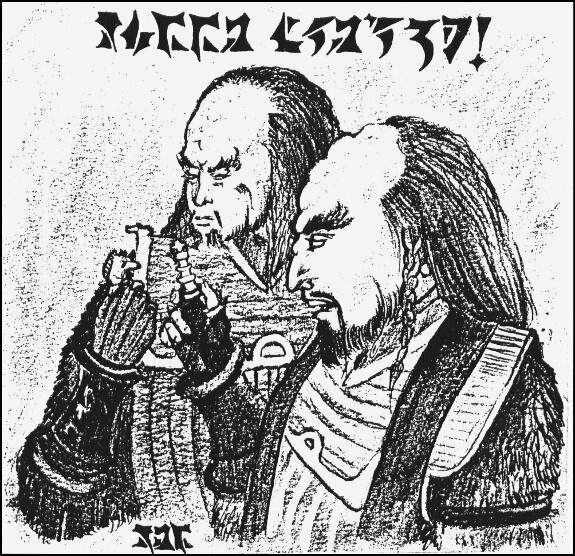 Don't forget: there is no word in the Klingon language for "Future. " There are reasons for that. As Klingon warriors, we should not embrace the Earther concepts of what the future might bring. If one looks too hard at the sword across the room, he may not see the knife at his throat. He also will look stupid when the future he anticipates does not unfold before him as he thought it would. I submit that it is not the winning of the battle that the warrior yearns for, but the battle itself. Yes. It is great to win. But it is also great to fight well. Both yield the sweetest fruit of all: glory. Everyone in the Empire does not need to hold this philosophy, but, as a warrior, I think that this attitude is essential. I want to try to start something new in the Empire that may help others discover this Klin. I would like to conduct my version of Klin-Zha as a play-by-mail game. Anyone interested can write me for a full description of what it will entail--even Feds. We can play in teams or as individuals. I hope that many of you will seek to discover the Klin as I have.